Personifies "Our Service Reflects Me" Staff Motto Spanish Interpreter Breaks Communication "Me llamo Maria Martinez, a sus ordenes." The greeting, which came from a diminuative lady in a white coat, lighted recognition in a face which had been taut with uncertainty. In one year since University Hospitals initiated its hospital patient language translation service, Mary Martinez has been an interpreter, translator, friend, social worker, cook and confidant for the hundreds of Spanish-speaking patients who find language a barrier. last year, she translated for more than 600 Spanish-speaking patients and their families who came to University Hospitals for health care. Some came from as far away as Brazil, some as near as a migrant camp in Muscatine. Mrs. Martinez assists with registration procedures and escorts the international guests to clinics or inpatient areas. She translates doctors' instructions or test results and assists in hundreds of other situations which would be routine for an English-speaking patient. personal service "This is a very personal service," says Mrs. Martinez, who is on call seven days per week, 24 hours per day. "You can't say to a mother who is miles from home with a dying baby 'Contact me at eight in the morning' I simply can't do it. These are my people, and believe me, I've been there." Maria interprets for an average of 10 people each day, but is constantly shuffling her already busy schedule to accommodate emergencies, delivery of babies, or especially trying times for families. Often it may mean spending the entire day with one family of a critically ill patient or sitting up all night with a young girl in labor. "I try to get across to them that we, University Hospitals, are really concerned about them. But it's like our University Hospitals staff motto says - our service reflects me. All I have to do is blow it once, and that family goes homes to their community with the attitude 'Well, don't go to University Hospitals. Maria Martinez won't help you.' I'd never want that to happen." culture barriers The barrier of communication extends beyond language to include culture as well. Here, Maria works as a two-way buffer to explain to hospital staff why a family refuses a procedure which is necessary for good health, but foreign to their culture. Likewise, she explains to the patient the need for specific actions. "Choosing to have an operation, for example, is often a matter of family discussion, and these decisions are not made very quickly," she says. "It's hard to say 'Sorry, Doctor, but the family will let us know when they're decided' when I know every moment may be critical." Food is another potential crisis area, because no matter how good the food might be, it is not what the Spanish-speaking patient usually eats.Maria has, with the doctor's and dietitians's permission, brought dinners from home, complete with tacos, enchiladas, chiles, Mexican chocolate, and other delicacies to patients who have had long hospital stays. books, pamphlets, and tapes Obviously, however, one person cannot be everywhere in a one-thousand bed hospital, so Maria has developed bilingual manuals which she leaves with hospital staff members when a Spanish-speaking patient can point to his need on one side of the page, and the staff member can read the translation on the corresponding line. 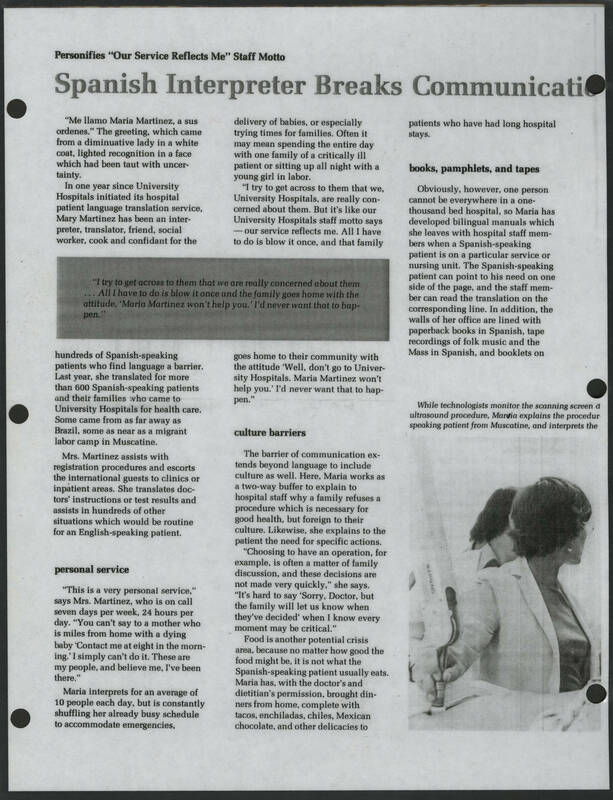 In addition, the walls of her office are lined with paperback books in Spanish, tape recordings of folk music and the Mass in Spanish, and booklets on While technologists monitor the scanning screen d ultrasound procedure, Maria explains the procedur spooking patient from Muscatine, and interprets the "I try to get across to them that we are really concerned about them... All I have to do is blow it once and the family goes home with the attitude, 'Maria Martinez won't help you.' I'd never want that to happen."